Hello friends, I’m very thrilled to inform you all that egglesscooking.com has been nominated for the Best Food Indiblog of the year 2008 by Indibloggies. Take a look at the other Indian food blogs nominated and if you like mine the most, vote for me here. After trying the barley flour chocolate cake I was confident that barley flour would be good in brownies too. 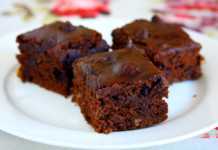 I decided to use barley flour in the oat flour-beet brownies recipe which I had tried earlier. This time I wanted to make it vegan too, so I used unsweetened chocolate instead of semi-sweet chocolate and increased the quantity of sugar. 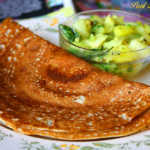 If you don’t want to make it vegan simply follow that recipe but use barley flour instead of oat flour and pumpkin puree instead of beet puree or use beet puree itself. It’s hard to believe that these delicious brownies are vegan, made with barley flour and not sinful at all. Preheat the oven to 350F for 15 minutes. Coat an 8-inch square pan with cooking spray or line it with aluminum foil like me leaving enough foil hanging on both the sides so that lifting the brownies with the foil is easy and so is cutting the brownies too. Melt the chocolate and margarine in the microwave oven, in a large bowl. Take care while doing so or else the chocolate will get burnt. So increase the time little by little. Stir it well, it should be smooth. In the same bowl, combine the pumpkin puree, sugar, cocoa powder, vanilla, and unsweetened applesauce and whisk it well. This mixture should be smooth and creamy. I found that this mixture was very stiff, so added 1/4 cup of water (pumpkin cooked water) too. Sift the barley flour over the liquid ingredients directly. Then stir the baking powder, chopped pecans, and salt with a wooden spoon. Pour the batter into the prepared pan, smooth it out with a spatula and bake it for about 35-40 minutes. Mine was done after 38 minutes. Brownies should spring back when touched or simply do the toothpick test. Cool completely in the pan on a wire rack. Since I lined the pan with aluminum foil I lifted it after an hour and I cooled it on a wire rack. After another 2 hours, I was able to cut them into neat squares without any trouble. If baking it directly in the pan, it will take some more (actually a lot more) time for the brownies to cool completely and getting neat pieces will also be difficult. The barley flour brownies tasted awesome. It was mildly sour which I think is because of the applesauce. See My Notes section for more details. Like the oat flour brownies I felt a slight difference in the texture but it’s not a big deal. Once refrigerated you hardly realize any difference at all. I wanted to use only pumpkin puree for these brownies but I had only 1/2 cup of homemade puree left. So I had to use unsweetened applesauce for the rest. I think the brownies were mildly sour (others did not feel this though) because of this. So you can either increase the quantity of sugar by 1/4 cup or use more of pumpkin puree/beet puree than applesauce. For the oat flour and beet brownies I had used 1 cup of beet puree and just 1/4 cup of applesauce and did not find it sour. You could follow the same measurement for these barley flour brownies too. You can use all purpose flour too instead of barley flour. You could use store-bought canned pumpkin too. I think in that case you would have to add additional water because the canned puree is very stiff. I always cook the puree at home. Actually, I prepare three vegetable purees at the same time and freeze it. It’s carrots, pumpkin, and beets. I use a big pressure cooker for this. Clean, peel and chop the vegetables into bite size pieces. Take 3 utensils which will fit the cooker and add each vegetable to one utensil each and add enough water to cover them and leave the cooker for 1 whistle. Once it is cool enough to drain the vegetables and use a blender to get a smooth puree or puree it while it’s still hot with an immersion blender. 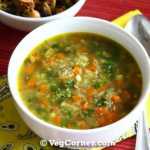 Save the vegetable cooked water and use it while preparing soups. 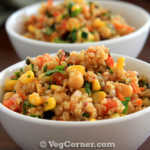 Transfer the puree into 1/2 cup size containers and freeze it and use it whenever needed. Thaw it overnight in the fridge if you want to use it the next day. Home made pumpkin puree is not as stiff as the canned one. After thawing I found that it had way too much water. So I had to strain the puree in a fine-meshed sieve to separate the water. 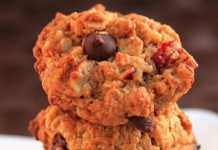 I just made these, but with oat flour instead of barley. I also added a touch of cinnamon and sprinkled some chocolate chips on top. They are so fantastic! Thank you very much pumpkinpie. I too have made brownies with oat flour and its definitely good too. Just voted for u. kudos! Will check it out Sweatha. Here’s one that made me think of you, for you to play with! That’s a nice recipe Deepa. Thanks for the link. Congratulations on the Nomination Madhu ! Hope you win in the categories you mentioned ! Hugs ! Hope S and A are doing good! Thanks Sweatha. I’ll wait for your entry. congrats for the nominations Madhuram !! 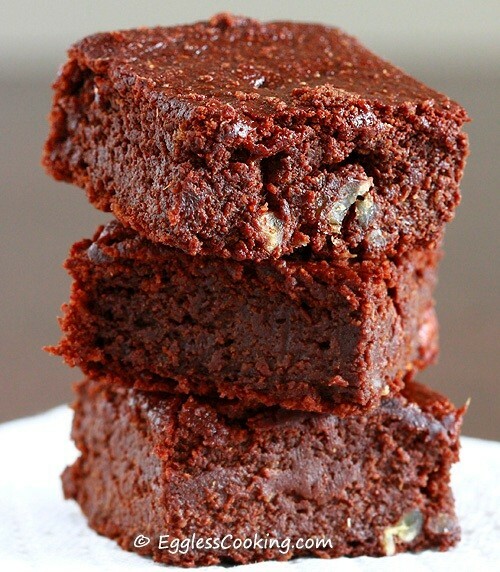 this brownie is very healthy with barley and inclusion of pumpkin , apple n pecans….the photo is just great !! Been reading ur blog from a long time…. and i am so happy to find a blog from which I an make completely egg less cooking/baking. 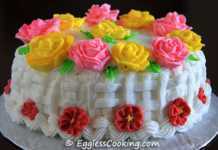 My cakes, muffins etc are coming out so well� at my place they don�t believe its egg less cake or muffin.. All thanks to u�. Thank you very much Bharani. I did vote for you about 3 to 4 days back…Congrats!!! Oh!, thanks Cilantro. I didn’t know about the nomination until yesterday. Mmmm those looks so good. Looks like the texture is perfect. How about using Pumpkin puree itself instead of any applesauce as you have mentioned for the Beet Brownies? Thanks abc. Yes you could use thick pumpkin puree itself for the applesauce too. 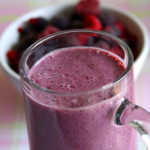 If you are using store bought puree, dilute it with water. As I have mentioned in the post I didn’t have enough of it.